Austin.com Would You Subscribe To A Hamburger Service? Now You Can! Would You Subscribe To A Hamburger Service? Now You Can! The hamburger is a classic American food, served from coast to coast in all shapes and forms imaginable. From veggie to kobe beef, topped with anything from the standard ketchup to kimchi sauce, or even pickled okra, there’s a burger out there somewhere that fits just about everyone’s tastes. Even if that means you’re looking for a hunk of grass-fed beef between two fried donuts. What’s constantly being innovated in the burger space is how they are made and delivered. Currently, most burgers are served tableside at restaurants, carside at drive-through joints, or just grilled at home. 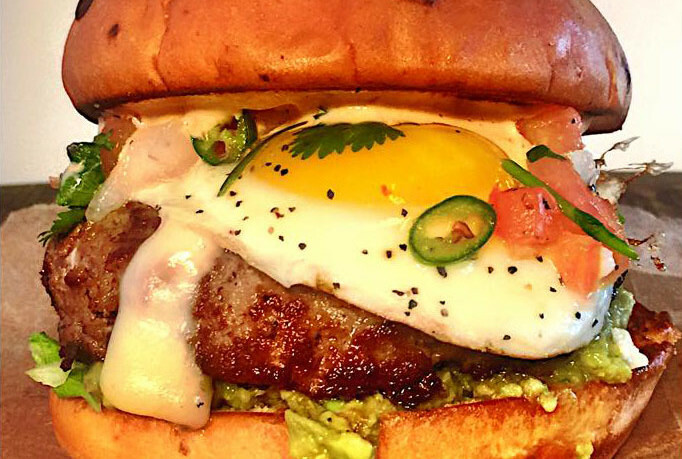 But we can now safely say that one of Austin’s first couples of the burger, Ryan and Gina Blackmore (formerly of Your Mom’s Burger Bar on Airport Blvd., now closed), have advanced the science of burgers to a whole ‘nother level. Meet Your Mom’s Burgers, the first subscription-based burger model we could find anywhere. Featuring a “ready to cook” meal delivery service and flexible ordering options (you don’t have to subscribe), your burger fix is just a few clicks away. Husband and wife duo Ryan and Gina aren’t new to the burger world, of course. Your Mom’s Burger Bar is sort-of legendary in Austin. It wasn’t just Austin that knew the greatness of Your Mom’s, either. They were so famous that The Food Network even stopped by once, just to film a segment about their veggie burger. Not content to accept defeat in the retail space, Ryan and Gina fashioned a new business model, a new website, and bought a snazzy new domain — www.YourMoms.love — which they hopes bring a more home-like feel to the whole online ordering process. The good news for fans of the old burger bar is that Your Mom’s is still serving up their famous burgers, like the Norma Jean, the Frida (complete with an egg on top), the Willie Nelson (best BBQ burger ever), along with the Buffalo Bill. For just $12.25 per person, your meal will even come with sweet potato fries or onion rings. And if you’re not much for the menu, you’ll still be able to create the same custom burgers that you would’ve otherwise had to go to a restaurant for, and they all cook up in under 30 minutes. I was able to try both the Norma Jean and my own burger with some Your Mom’s zesty Goodfella sauce on top, along with some of Ryan’s famous sweet potato fries. After that experience, I have nothing but praise for Your Mom’s. Still, I will say that following their cooking directions is very important! Thankfully, everything comes in sealed packages and the burger is very easy to prepare. There’s quite a lot to each helping too, so even if you can’t eat everything right away it will still be fresh after 3-4 days in the fridge. Gina said that this new iteration of Your Mom’s Burgers has received an enthusiastic response even with the strange new business model. Yeah, some people are a little confused that it isn’t actually a restaurant, but it’s all made clear on their website. The couple’s next goal for their subscription business? Hot dogs. Hope you’re hungry! Your Mom’s Burgers are available in zip codes starting with 789, 765, 786, and 787. If that’s you, give Your Mom’s Burgers some love!